Long weekend! We need slaw! Ben and I recently purchased our first grill (just the next step in our semi-suburbanization, yikes) and since then (aka last week) we’ve grilled approximately a thousand burgers. And brats. And hotdogs. Because HOW GOOD are hotdogs though? Also Cheetos. I mean. It’s been a rough (read: FATTY) couple of weeks over here. But check out this slaw! If you serve slaw with a side of hotdogs and/or Cheetos, is that really so bad? This crisp and tangy cole slaw (which, for a time — a pretty long time, if I’m honest — I thought was actually pronounced “cold slaw”) is based on one my Gramma Inez makes. Hers is usually all green, but I added some carrots and red cabbage for sweetness and color. Dark sesame oil and a generous sprinkling of toasted sesame seeds take this crunchy salad to the next level – it’s at once bright and deeply nutty. Grams also sprinkles some crunched up, dry ramen noodles (straight out of the package, minus the spice packet, obviously) on her version, but I didn’t have any so I left those out. They add a kind of fun, unexpected element if you want to throw them in there. I hope you enjoy a safe and happy Memorial Day weekend! 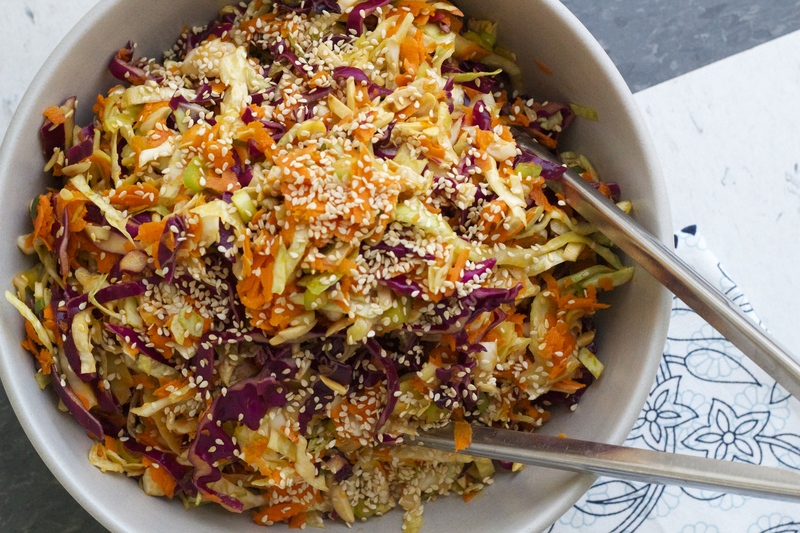 Filled with love, gratitude, and mounds of sesame slaw. And (probably) Cheetos, if you’re coming to my house. 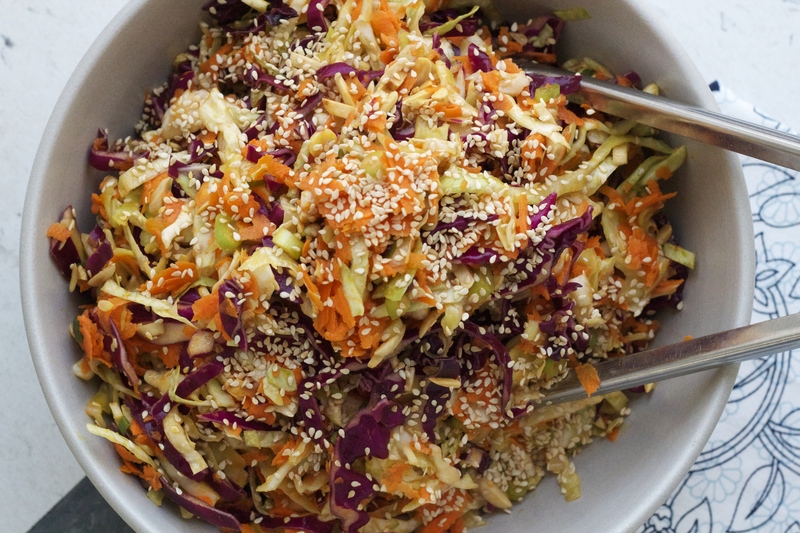 This slaw is best made the day before you plan to serve it – it holds up well in the fridge, and the extra hours allow the flavors to really marinate and meld. It’s great for serving along with burgers, hotdogs or chicken on the grill, and I also love it as a bright, tangy foil for pulled pork sandwiches. If you wanted to add a few squeezes of sriracha in the dressing, I wouldn’t hate that idea. 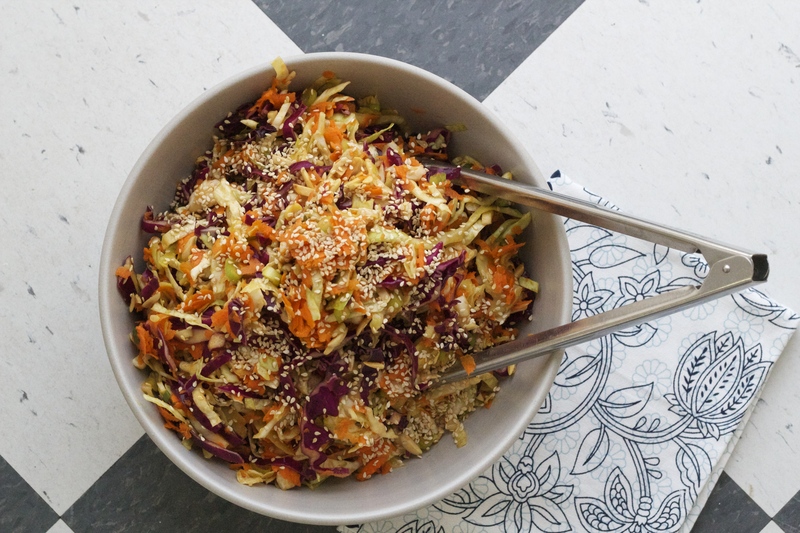 In a large bowl, toss together the sliced cabbage, scallions, carrots and sesame seeds. Drizzle the rice vinegar and sesame oil on top, then sprinkle with kosher salt and celery seed. Toss the cole slaw to distribute everything evenly, then taste for seasoning — if it needs some extra sesame oil or salt, give it a hit. Cover the bowl with plastic wrap and let the salad sit for at least 4 hours, or overnight. Serve chilled, with a few extra sesame seeds on top to garnish, if you like. Can I come to the aforementioned rose/slaw/cheeto party! ?